Getting It Right – Christ in me is the answer! These words sometimes haunt my soul. In times of sadness or overwhelming pressure the heavy weight of incompetence drags my emotions to great depths. Every move, every decision, every encounter is laced with feelings of failure. There seems to be no way out of this maze of insecurity. These false impressions plague everyone at one time or another. Times of physical and mental fatigue or very difficult circumstances can be the conduit for hopeless thoughts that tempt us to give up. Often what we need is rest. Going to bed at an appropriate hour and sleeping deeply can reverse one’s view of a situation tremendously. Other times we may need to take a break. We can put aside the things that are bothering us and do something fun. This may seem counterproductive when you have a minimum amount of time to accomplish a task, but the short break will refresh your mind and feelings. Exercise is another helpful activity when it comes to changing the mental picture we have of circumstances or ourselves. A good brisk walk gets the blood pumping and sparks the brain to think more clearly. But very often what we need is a change of perspective. When doubts about our personal ability to “get things right” threaten to undo, it is helpful to realign our thinking. We Christians must remind ourselves that we have died with Christ and no longer live. Instead Christ lives in us. This life that we now live in the flesh we live by faith in the Son of God who loved us and gave Himself for us. When someone is seeking to live by faith God will guide him or her through every move, every decision, and every encounter. He will provide the strength and wisdom that is needed for each situation. Consequently, there is no need to feel powerless or incapable because you can do all things through Christ who gives you strength. This thought is just a bunch of dead words. The truth is that the One Who lives in a believer is infinitely powerful. And when you are allowing Him to live in you and control your life, you can always get it right! This weekend Dad started digging up potatoes. The cool September weather was perfect to begin uncovering this buried treasure. You carefully penetrate the earth at the base of the hill with your fork, turn over the soil, and examine what you find. The dirt falls through the fork tines leaving an abundance of tubers. I am always amazed at the harvest when I think back to the spring when we first planted the seeds. From down in the root cellar we excavate all the left over potatoes from the year before. They have gotten old and started to get soft. But the amazing thing is that from these useless potato leftovers sprouts have begun to grow. By cutting pieces containing potato eyes and planting them in the newly turned earth they begin to take root. 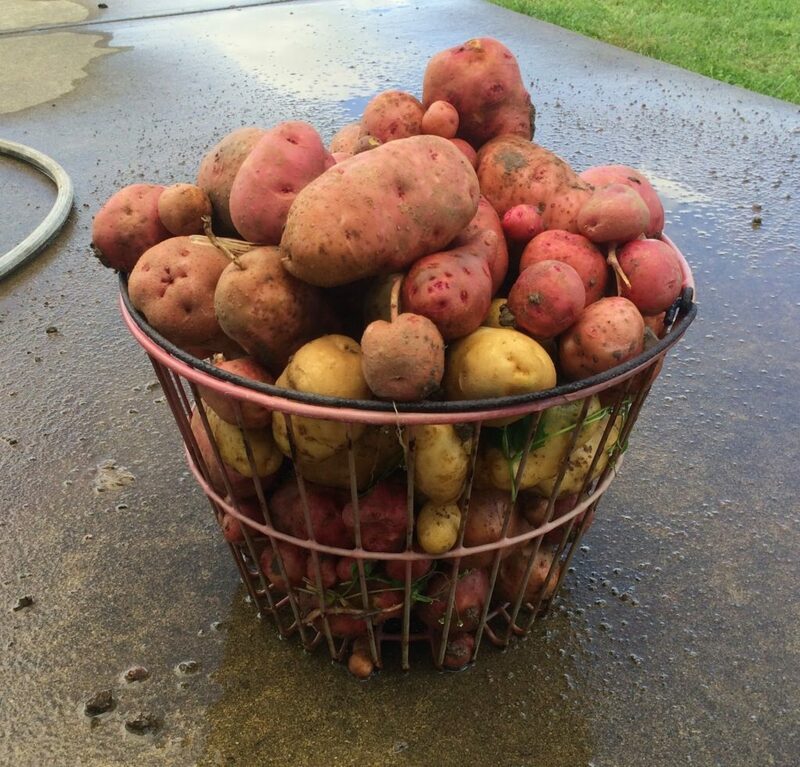 When the autumn rolls around you can easily expect to harvest 5-10 new fresh potatoes from each plant. What an investment! Jesus used the example of a grain of wheat falling into the earth and dying. One little grain when it dies will grow into a plant that bears much fruit. He was explaining that His time to die was about to come. It would seem like such a waste to those who loved Him, but in giving up His life many other lives would receive the opportunity to live. This was the only way to save the world from the spiritual death of eternal separation from God. The fruit of His resurrected life would be all those who believed in Him and accepted the everlasting life He offered. 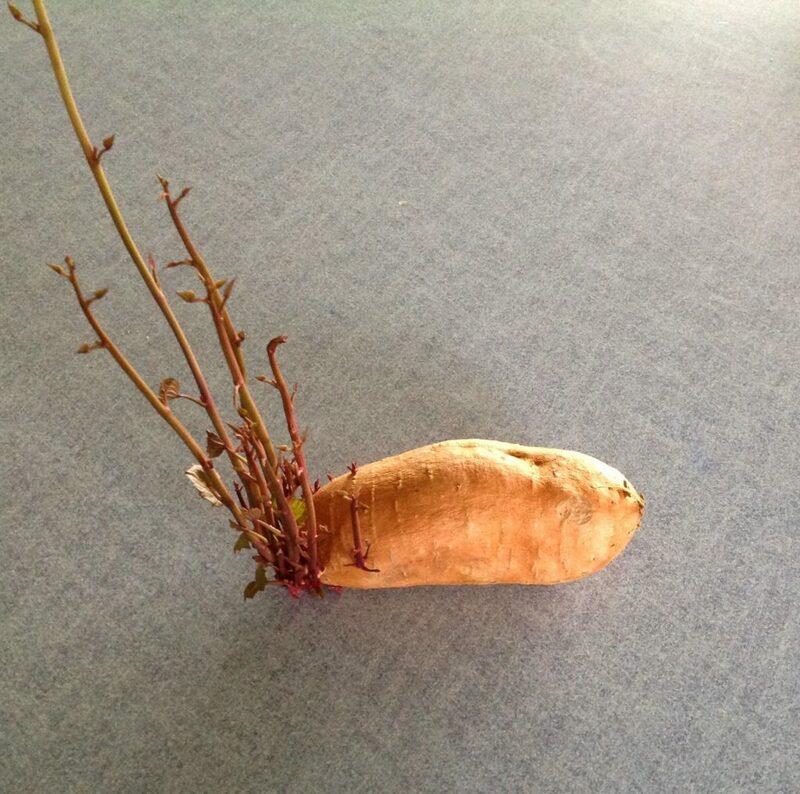 Learn a lesson from dead shriveled up potatoes. In letting them die and planting them in the ground, they produced a crop that will keep us fed this winter. By accepting Christ as your Savior and allowing your old way of living to die with Him, He will produce the amazing crop of eternal life for you and for all those around you who believe. Now that is something that is worth the investment!